A couple of weekends ago, I went on another “rock star book” hunt, and I found a bunch (all nicely loaded into my iPad). None of them are “main stream” or very popular (some didn’t even have reviews yet), but that’s okay. There’s a “first time” for everything (and some of my favorite books recently, have been relatively unknown). Each of my “finds” had a synopsis that tickled my fancy, (you know… the whole, normal girl accidentally runs into her favorite star or, maybe even someone she doesn’t personally recognize) but quickly gets caught up in the whirlwind of insecurities and fangirl crushes that go along with dating a rock star. So it was good enough for me. I’ve actually already read a few, and the majority of them are worthy of a review (a few… not so much). One I couldn’t finish – there was NO swooning over that jerk of a rock star, and one had a GREAT start, but again, the rockstar was wayyyy to obnoxious. While I like a little “game” playing, and emotional heart tugging angst, (and I like to joke that I’m a sucker for punishment), I do have my limits. And a few of these… *eeeek!*. Rockstar nightmares!! I think I’d rather run into a bloodthirsty vampire, and take my chances. Hehe. Maybe I’ll review ’em anyway, for the “fun of it”. But I need to get over them first. Which brings me to this book (quick note – I got the ebook bargain priced – the paperback, however, is quite expensive). So. I found this book about… Rockstars. Yay! Read the premise. Fluffy read. Double Yay!!! Read the book, and crashed (in a sort of *good* way, though). Lots of bubble gum potential and sigh-inducing moments, but intertwined with crazy and angsty downward spirals. And not the cute and easily fixable angst either. Really difficult life moments, and adult choices that, really when you think of it, what would you do? Maryse: I read this tragic and long book this weekend. It was so good that it sucked me in – another 4am’er. Then when I finally went to bed and I couldn’t sleep ’cause I was dreaming if it. It was a romance but along the lines of Jamie and Claire (in the Outlander series) but for rockstars. You know, without the actual “adventures’ but still some pretty scandalous life stuff. “Michael” the rock star would do and say the most amazing things… and then he’d turn around and screw it all up. And the main girl (Annie) – she drove me crazy too… but I dunno. The book tried to kill me and turned me in to a useless blob for the weekend. I LOVED it. And hated it. Only 3 other reviews for it, and all three are spot on. Lily: really? So tell me what its about. Maryse: Okay, so the book is about a girl with an unknown band that garners a place in a “Battle of the Bands”. A famous band is sponsoring the contest, and each member of this popular rock band is assigned to mentor one of the “battle bands” for the remainder of the competition. Her band gets the lead guitarist. He’s her idol and she’s in *fangirl* love w/ him. Sounded like your typical fluff-candy romance, and I was all excited! Maryse: and he visits her at night – and they totally TOTALLY fall in love. It’s awesome, still fluffy. Trying to hide it at “work”. Lots of seduction but you can tell – he’s not just trying to get in her pants, but in public they don’t even talk or try not to – but everyone can tell. And anytime some guy comes up to her (for example – his singer who likes to egg him on) and flirts with her like crazy, it makes Michael the “guitar god” see red, so some hot typical romance fare there too. While the adrenaline of the “new love” moments are intense, plentiful and perfect (and to top them off, they involve the heroine’s biggest crush, who just happens to be hugely famous), the dark moments are equally balanced. You’ll find yourself smiling, swooning, and elated, and then deeply perturbed, disturbed, saddened and irritated (oh yes, both heroine and hero can be exasperating in this one). Maryse: and bad stuff happens. Lots. Accidents, drugs, groupies, breakups and makeups, and that’s just the first quarter of the book. They both make some pretty ugly decisions. Stuff that *might* be fixable, but instead, gets worse. Ugh just pure darkness at times. But he could be SO pure, I loved him (and then, sometimes, hated him). Very human, but not necessarily a jerk. Anyway, it’s like that – very dark, and very light. Time apart – some therapeutic, some devastating. Lily: oh wow, I love when I read a book and cant stop thinking about it. Lily: but you got a HEA? I wasn’t sure if i was gonna review… some really difficult subject matter in this one. Maryse: if you want fluff (and I often do) this ain’t it. Lily: right. I like the hard and gritty. I like when the relationship feels real and its not all puppy dogs and rainbows. Maryse: Yup and this is what it was. Ahhhhh… that was therapeutic for me to get that book out on you. heheheh I feel much better. Darn thing!!! Lily: I am you dark passenger. lol! Did I love this book? Yes, I think I did. I couldn’t put it down all weekend. Was it worth the read now that I know all of the *stuff* I was in for? Yes, absolutely. Did I expect the *dark* moments to be so intense? No, and I’ll tell you, right now, it took me a few days to decide if I actually liked the book, let alone loved it. I enjoyed it, but was insecure about it. In reality, maybe it wasn’t as *dark* as I felt it to be, but I literally spent my life in that book for two whole days, and it tore me apart. I was them. The writing was such that I was sucked right in. But it’s been two weeks, and I’ve gotten over the dark moments and can be more rational about it. Oh and it didn’t help that I read a “vague” review (I avoid reviews like the plague usually but *woops*) and I misinterpreted something the reviewer said, which in turn, had me nervous (which might have amplified my leery mood while reading this). Your Dark Passenger approves! I am going to read this one. Lil… I’ve just started her 2nd book tonight. I don’t think it’s related directly to this one, but the premise – OH yes! A rockstar photographer (who’s pretty much jaded when it comes to musicians – she’s not impressed with bad boys at all) hired to go on tour for a year w/ a band, to capture their most gritty moments. Oh you know this one’s gonna be good too! I’m in…I’ll start it tonight, I’m afraid you’ve created a monster! Finished in two days, up til 6am. Amazing, agonizing! too real sometimes but I cannot stop thinking about it and couldn’t put it down. Super good, although come on with all the traumatic events, maybe one too many. But over all loved it. I loved this book! It was great. Totally fell in love with the characters. Screamed at them, cried at them, laughed at them, hated them and loved them! Now I miss them! Wow. This book consumed my weekend. Today was my sleep-in day but I couldn’t. I was dreaming about this book and had to get up to finish. What a roller coaster!!! I swear, I wanted to kill both characters many times, but Annie really pissed me off, always expecting and thinking the worst. I’m still not sure how I feel. I’ll tell you this- I’m exhausted! I really loved it, but it was so emotionally draining to read! I can’t start another book today. I thank you from the bottom of my heart for your kind comments regarding my two novels, “Sheet Music” and “For All The Right Reasons”. I can’t tell you what a thrill it is to hear how my books kept you up at night and that you were dreaming about the characters when you did manage to get some sleep! This is exactly why I love to write! For those of you that loved “Sheet Music” you will be happy to hear that the book I am currently writing will bring back those characters that made you lose sleep. “Covered In Lace” is my next rock ‘n’ roll love story. In this one, Lacy Sheridan (from the band, Lace) gets her own story. 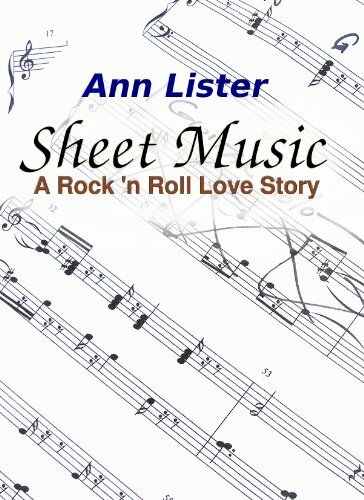 I loved her character in Sheet Music and decided she needed her own book so that she could find true love, much in the way Michael and Annie did in Sheet Music. And of course, Michael and Annie will have a part in this book, too!! I have a couple of novels scheduled for release prior to “Covered In Lace” but I do hope to have it in print soon! Feel free to watch my website for updates or follow me on my facebook Author Page! Very best to you and happy reading! Oh WOW – Im terrified of reading this book now and its right on top of my TBR pile! But I cant NOT read it! Maryse – plse plse tell me – does this book remind you of Love Unscripted? That book was dark for me and Im just wondering if this one is in the same line?